There’s more to life that just economics and sport plays an important role in PMCA – in particular racket sports, including table tennis and tennis. This year (2012/13) has been exceptionally successful for the PMCA Terenure Team in the Leinster Table Tennis League (Premier Division). Not only did they win the Premier League in some style but they also won the Premier Division Cup Final on Monday 15 April – a well-hosted event at Balgriffin TT club that finished 7-6 in PMCA Terenure’s favour at 2.30am after an epic match (and the spectators stayed to the end). 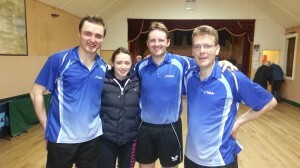 Pictured following their recent success in winning the Leinster Table Tennis Cup (Premier Division) are the PMCA Terenure Team members (L-R): Artur Lewanczuk; Sarah Timlin; Marcus McDonnell; and Pat McCloughan (Captain). Elsewhere this season, team captain Dr. Pat McCloughan was selected to play for the Ulster Veterans TT team in this year’s Irish Interprovincials Championships held during 12-13 April at the David Lloyd Centre in Belfast. The Ulster Team prevailed and won gold in the event. Later this year (September 2013), Dr. McCloughan will represent the Irish Veterans (40s) Team at the Six Nations to be held in Dublin (13-15 September at ALSAA, near Dublin Airport).